Bess of Hardwick (1527-1608) built the original home on the site in 1552. The house passed to her son William Cavendish, who became the first Earl of Devonshire in 1618. The 4th Earl of Devonshire, William Cavendish (1640-1707), became the 1st Duke of Devonshire for his part in bringing William of Orange to the English throne. The first duke is responsible for the house visitors see today. He pulled down Bess’s house in 1686, and with architect William Talman, started construction on the palatial house that stands today. It took more than 20 years to build and was completed the year of his death. The 4th Duke, by marrying the heiress daughter of Lord Burlington (Palladian prophet, builder of Chiswick), brought even greater wealth and properties into the family. Since the time of its completion, Chatsworth has had “open days” for public viewing. It is said to be the inspiration for Mr. Darcy’s estate in Jane Austen’s Pride and Prejudice and actually serves as Darcy’s Pemberley in the 2005 movie. The home’s five original state apartments were never visited by William and Mary, for whom they were intended, but Queen Victoria visited Chatsworth during the reign of the 6th, or Bachelor Duke (1790-1858), who was the first to make substantial changes to Chatsworth. In addition to adding a new wing, his most substantial changes were brought about by landscape designer Joseph Paxton, who also built the Crystal Palace in Hyde Park. Like the Crystal Palace, his Great Conservatory at Chatsworth is now gone, but his rockeries and fountains remain. During World War II Chatsworth was occupied by a girls’ school. The rooms and corridors were dormitories, and the drawing rooms and larger bedrooms were classrooms. The 11th Duke inherited Chatsworth in 1950 following the sudden death of his father. (His elder brother, who had married President Kennedy’s sister Kathleen, had been killed in the war.) It would take him 17 years to pay off the 80 percent death duties and would require selling off some of the estate’s art collection and deeding the Devonshire’s Hardwick Hall to the National Trust. Chatsworth, too, needed substantial repairs and modernization. By opening Chatsworth to the public and establishing the Chatsworth House Trust, the 11th Duke was able to preserve Chatsworth for future generations. When he died in 2004, the Guardian said the 11th Duke was able to turn his magnificent stately home in Derbyshire “into a public resource without compromising its dignity or losing it as a family home.” His son, the 12th Duke, continues living at Chatsworth. The baroque palace of Chatworth with its surrounding 12,000-acre estate in the Derbyshire hills has repeatedly been selected as England’s favorite country house. Despite its fairly remote location, it draws 300,000 visitors a year. The collonaded, pedimented view of the house that is most photographed is not the entrance through which visitors enter. The portion of the house built before the addition of the 1820s wing is constructed around a central courtyard. Only a portion of the home’s 297 rooms are open to the public. Perhaps the most recognizable of these is the Painted Hall, so named for the 17th century paintings of Julius Caesar that adorn the ceiling and walls. Floors here are of black and white checkered marble, and the hall’s focal point is a broad central staircase balustered in gilt iron and carpeted in red. After climbing stairs in the Painted Hall and the Great Stairs, visitors come to the five original state apartments: the Great Chamber, the State Drawing Room, the State Music Room, the Bedchamber and the State Closet. Each features ceilings painted in the 17th century, as well as fine woodworking craftsmanship on the walls. It is thought the state bed which retains its 1700 coverings belonged to George II. The library is roped off but can be viewed by visitors before they stroll into the Ante Library and its adjacent Dome Room, which features a windowed alcove flanked by polished marble columns. The 1820s wing houses the Crimson Dining Room where Queen Victoria was feted while she was still a princess. Other rooms on the public tour include the 6th Duke’s Oak Room, a Grotto, Sculpture Gallery, and the Chapel. Treasures (paintings, sculpture, and furnishings) from London’s Devonshire House, sold in the 1920s, and from Lord Burlington’s Chiswick House melded with those already at Chatsworth to give Chatsworth what is said to be the finest art collection of any English country home. 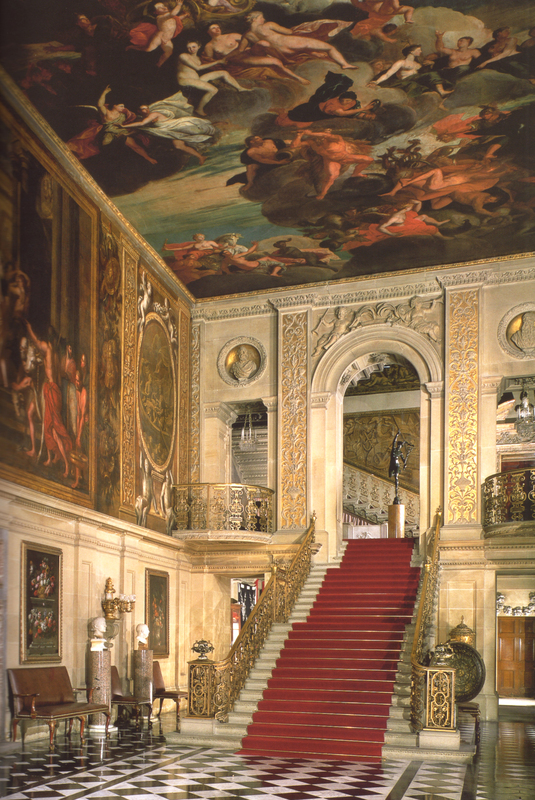 Chatsworth has been selected as one of England’s nine Treasure Houses. 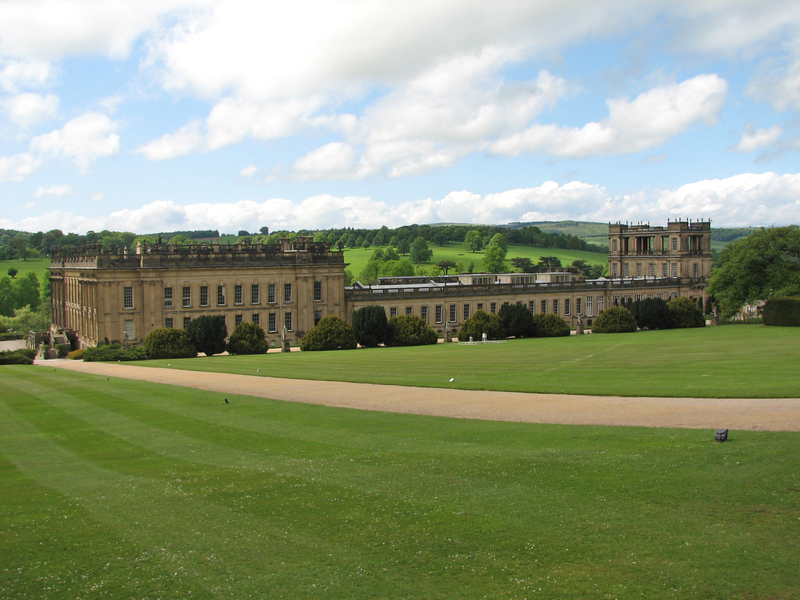 It is difficult to separate the palatial house of Chatsworth from the stunning grounds in which it is set. The 35,000-acre agriculture estate offers a 1,000-acre park that is open free to the public. Wooded hills with footpaths rise above the house, and the River Derwent rushes alongside the property’s pastoral sheep pasture. One day is really not long enough to explore all this property has to offer. In earliest times, the house, which sets at the foot of the Derbyshire hills of the Peak District, was surrounded by formal gardens. The 4th Duke, however, demolished the 1st Duke’s formal gardens when he chose Capability Brown to landscape the parkland around the house in 1756. 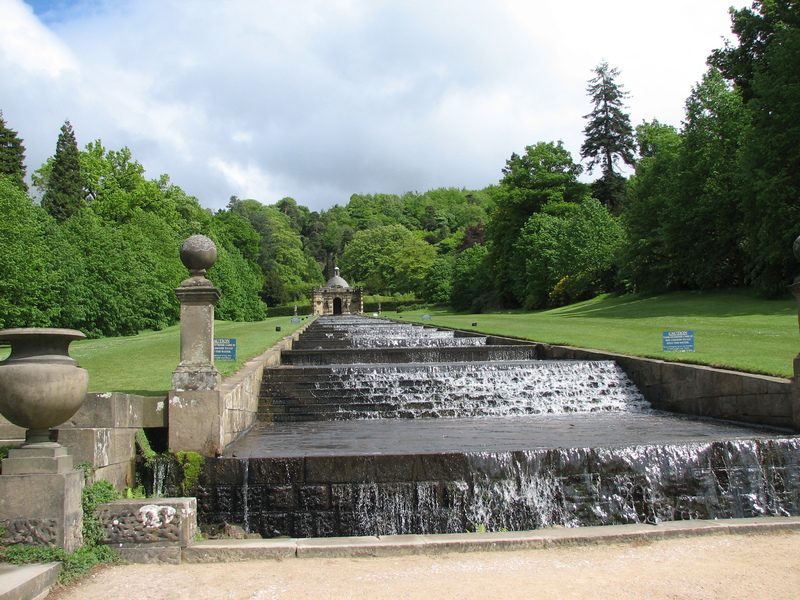 Fortunately, the 1st Duke’s cascade and the temple above it, voted Best Water Feature in England, has survived, along with his Willow Fountain, Canal Pond, and Flora’s Temple. Capability Brown’s scheme to make the grounds around Chatsworth look natural included the planting of broad lawns and a variety of American trees. Landscape architect Joseph Paxton’s (1803-1865) mark on Chatsworth is the most distinct today. Trained at Kew Gardens, Paxton is responsible for the huge rockeries, the pond their water flows into, the Azalea Dale and ravine, and the Bamboo Walk. In modern times a maze constructed of 1,209 yew trees, flower gardens, and a Serpentine Hedge have been added. The original stable block, constructed to house 80 horses, is now used for the Farmyard demonstrations, and the 6th duke’s carriage house now serves as a restaurant. For children, there is an Adventure Playground. One thing remains from Bess of Hardwick: the 16th century hunting tower, nestled in the verdant foothills.–Cheryl Bolen’s newest Regency historical release is Miss Hastings’ Excellent London Adventure. Note: Cheryl will be writing about the ten Treasure Houses of England. These are selected for their grandeur of architecture, furnishings, landscape, and historical significance. Blenheim Palace was built between 1705 and 1722 to honor John Churchill (1650-1722), 1st Duke of Marlborough for his victory over the French at Blenheim (Bavaria) in 1703. 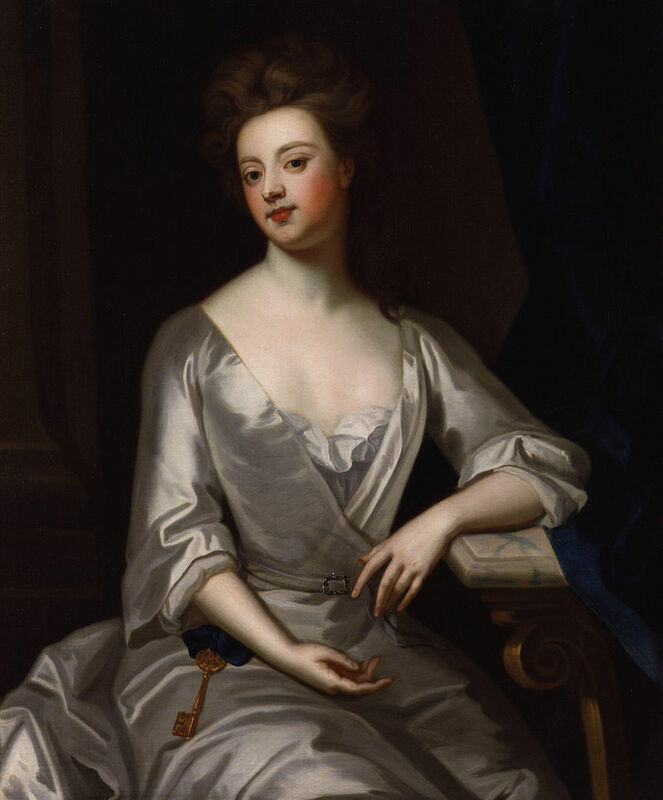 Churchill had previously married Sara Jennings (1660-1744), a lady in waiting to Queen Anne, the monarch who gave them the royal park at Woodstock and authorized the construction of a palace there. The architect of Castle Howard, Sir John Vanbrugh (who had no training as an architect), designed the baroque palace, with assistance from Sir Christopher Wren’s top assistant, Nicholas Hawksmoor. It was Vanbrugh’s intent the palace be a monument, castle, citadel and private house – in that order. 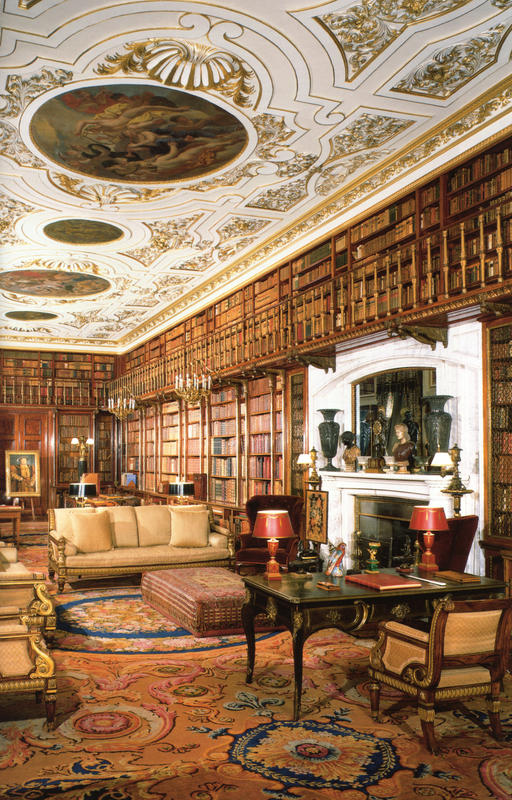 The last room to be completed, the long library, was not finished until ten years after the 1st Duke’s death. Though she preferred plain and cozy, the 1st Duchess threw her heart into the palace’s completion to honor her beloved husband – perhaps the only person with whom she did not fight. By special dispensation of Parliament, the title passed to John and Sarah’s daughter, Henrietta, because their sons had died of smallpox before reaching adulthood. Upon Henrietta’s death, the dukedom passed through the son of her sister, who had married Charles Spencer. The old duchess Sarah’s private fortune passed to the second Spencer grandson, who became the 1st Earl Spencer (Princess Diana’s ancestor). The 7th Duke of Marlborough (1822-1857) was Sir Winston Churchill’s grandfather. Winston Churchill (1874-1965) said the two most significant events in his life occurred at Blenheim: He was born there, and he proposed marriage to Clementine Hozier there. The 9th Duke (1871-1934) bolstered the family’s sagging fortunes in 1895 when he married Consuelo Vanderbilt of the American railroad fortune, who brought $2.5 million (about $75 million today) into the marriage. Both bride and groom were forced into the marriage for reasons other than love, and the marriage that produced two sons ended in divorce in 1921. The duke and duchess quickly remarried others. Today, Blenheim Palace is the principal seat for the 11th duke and his wife. Blenheim lives up to the claim it is “Britain’s Greatest Palace.” The baroque palace is not only one of England’s 10 Treasure Houses (selected for grandeur of architecture, furnishings, landscape, and historical significance), but has also been named a World Heritage Site by UNESCO. Constructed of ochre-colored stone and topped with several graceful turrets, the central, u-shaped block opens onto a massive courtyard of which the grand, pedimented entry is the focal point. Wings on either side of the entry are connected by curving links. Visitors enter the great hall – the magnificence of which redefines that venerable English room. This great hall soars to 67 feet and features three towering tiers of arches, culminating in an upper tier of arched windows that flood the room with light. There’s a painted ceiling featuring the 1st Duke in Roman garb, and opposite the entry Corinthian columns support a huge arch that trumpets entry into the saloon, another vast stone room with elaborate marble door casings. On weekdays visitors are taken on a guided tour of the public rooms, which include the 180-foot long library, the red drawing room and the green drawing room, the green writing room, and state rooms hung with tapestries commemorating the 1st Duke’s battles. The room in which Winston Churchill was born is also displayed, along with a self-guided Churchill exhibition. Visitors may opt to take a tour (about 45 minutes) titled The Untold Story, which uses talking portraits and special projection technology to tell the history of the house. Pick a pretty day to come here and plan to stay until dusk exploring the 2,100 acres. Children will enjoy taking the train from just outside the house’s main entrance to the Pleasure Gardens, which include mazes, a Blenheim Bygone exhibition, putting greens, giant chess game, kitchen and cutting gardens, and an adventure play area. But the main attraction here is the Capability Brown landscape commissioned by the 4th Duke in 1764 and completed 10 years later. 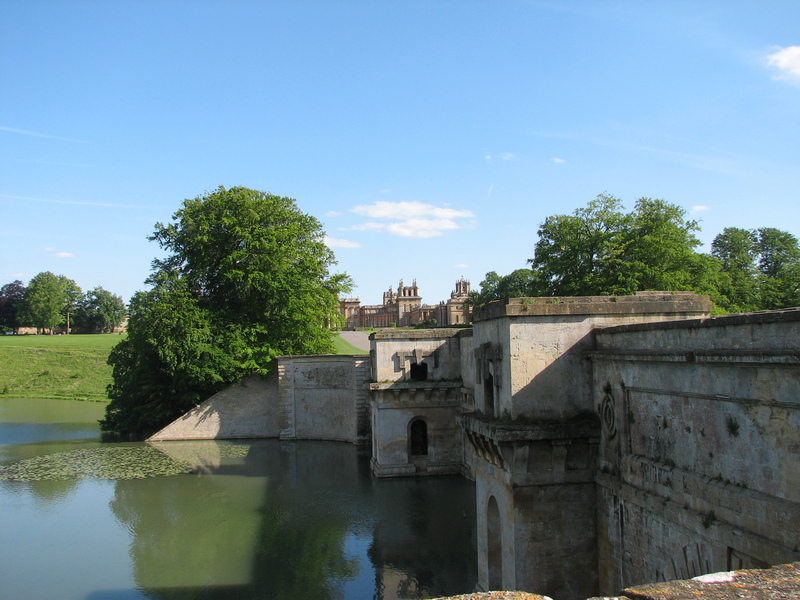 Brown created the lakes on either side of Vanbrugh’s Grand Bridge that had been built over the Glyme stream. A circular walk around the Queen’s Pool takes 45 minutes; another circular lakeside walk to the rose gardens also takes 45 minutes. A one-hour walk brings visitors to the rose garden and the Secret Garden (tropical) as well as across broad lawns. Two of the walks sweep past the Temple of Diana where Winston Churchill asked Clementine to marry him. In addition to picnic areas, there is one restaurant at the Pleasure Gardens and another adjacent to the Water Terraces. From the house’s grand entry, one can look straight ahead, past the Vanbrugh Grand Bridge to see the 1st Duke of Marlborough’s 134-foot high Column of Victory.–By Cheryl Bolen, whose next Regency-set romance novel, Miss Hastings’ Excellent London Adventure, comes out soon. Unlike his hedonistic eldest son, England’s King George III (1738-1820) did not philander. He settled down with his German-born wife, Charlotte (1744-1818), at age 23, and she proceeded to bear him 15 children over the next 20 years. He did not take mistresses. He lived frugally. And he derived great pleasure from his large brood–until the boys became men, that is. Eleven of the children would reach old age. Two boys would die before the age of 5, and his youngest daughter died while in her twenties. Of the 15, eight were boys and seven were girls. Two of the sons would rule England and another would rule Hanover. The younger brothers are less famous and tend to blur, even though they each led distinctly different lives. The girls, too, all seem to run together. Perhaps that is because their lives were all rather the same–as bland as their parents. The living conditions of King George’s daughters came to be known as The Nunnery. That is because none of them was allowed to marry at the age when most young ladies take husbands. Three of the daughters would eventually marry–but not until they were past the age of child bearing. Augusta (1768-1840) married the Duke of Saxe-Coburg, and Elizabeth married the Prince of Hesse-Homburg when she was 48 years of age. The only other sister to marry was Mary, who married the Duke of Gloucester, whose father was her father’s brother. The boys were raised in pairs, sharing domiciles and tutors. For example, the Prince of Wales and his brother Freddie (later Duke of York) were exactly a year apart, and they were never separated from one another. Freddie was the king’s favorite son, and when it became clear his elder brother was a bad influence on him, the king sent Freddie to Germany. The third son, William, later the Duke of Clarence and later still, King William IV, was sent to sea at an early age and, unlike his regent brother, was somewhat coarse. He lived as man and wife for more than 20 years with the actress Mrs. Jordan, who bore him 10 children. Their children took the FitzClarence surname. The next son, Edward (1767-1820), later known as the Duke of Kent, lived for many years with a French widow. He was a stern military man. After the regent’s daughter, Princess Charlotte, died in childbirth in 1817, he would be one of the brothers scurrying to take a legitimate wife in order to father a child who would inherit the English throne. He married a young Saxe-Coburg widow who had already borne two children. She bore a daughter, Victoria, who would succeed her Uncle William as ruler of England in 1837. 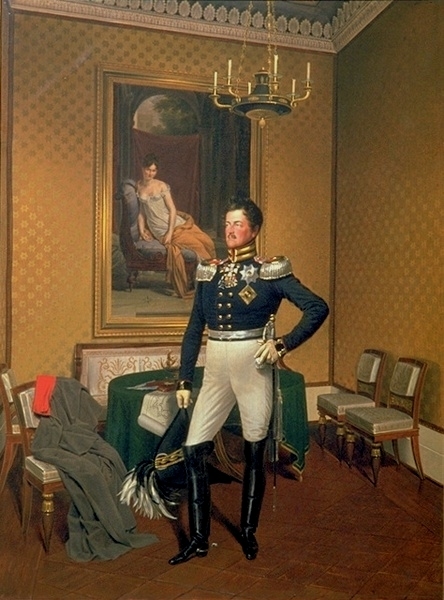 Ernest (1771-1851), the fifth son, became King of Hanover. He was the only brother to never have a weight problem. Another of the brothers to undergo an illegal marriage (as the Prince of Wales had done with Mrs. Fitzherbert in 1785) was Augustus (1773-1843). When he was 20 he secretly married Lady Augusta, who bore him two children, but the marriage was invalidated in 1801 because it violated the Royal Marriage Act. The last brother to live past childhood, Adolphus (1774-1850) was known as the Duke of Cambridge. Son Alfred, who was born in 1780, died at age 2. At his death, the king said, “I am very sorry for Alfred, but if it had been Octavius, I should have died too.” Months later, Octavius, who was born in 1779, became ill after being vaccinated for smallpox, and he never recovered. His father was almost inconsolable over the loss of his next-to-youngest son. How curious that a monarch who fathered eight legitimate sons had not a single grandson to serve as king. More odd still was that when George III’s only legitimate grandchild, Princess Charlotte, died when he was 78, there was not a single legitimate grandchild of George III.— Cheryl Bolen’s 37th book, Ex-Spinster by Christmas, is her latest release. Watch for Miss Hasting’s Excellent London Adventure in May. 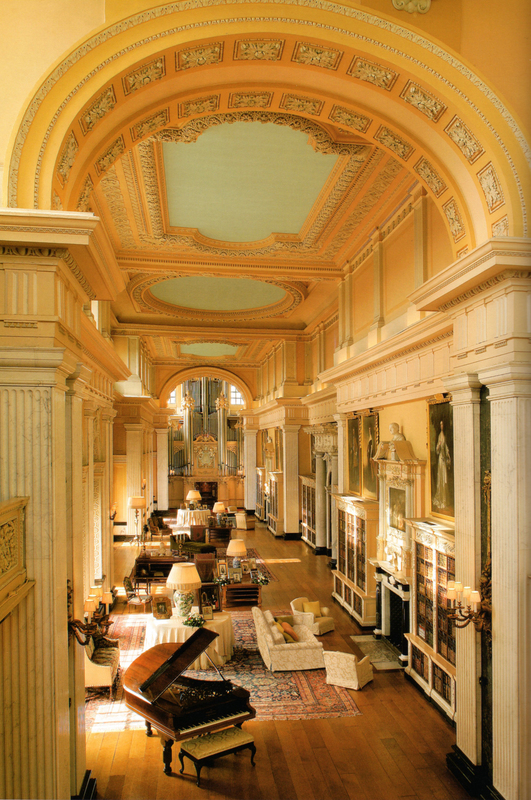 Author’s Note: The Treasure Houses of England are 10 spectacular estates. I’ll be doing a series here on each of these, seven of which I have been privileged to tour. Charles Howard (1669-1738), the 3rd Earl of Carlisle began construction of his great baroque mansion near York in 1700. A descendent of the youngest son of Thomas Howard (4th Duke of Norfolk), the 3rd Lord Carlisle chose for his architect John Vanbrugh (who also built Blenheim Palace). The 4th and 5th earls traveled extensively on the Continent and were great collectors, the 5th Earl having taken the Grand Tour with his lifelong friend Charles James Fox, the great Whig statesman. In addition to holding high public offices, the 5th Earl (1748-1825) added extensively to the castle’s art collection. After the death of the 9th Earl of Carlisle in 1911 and his countess 10 years later, the estates were divided among their children. His middle-aged heir received Naworth Castle (where he had been raising his family), and the eldest daughter received Castle Howard, but she passed it to her younger brother Geoffrey Howard, Liberal MP. On his death in 1935, Castle Howard went into a family-administered trust. The Earls of Carlisle now own Naworth Castle, and Geoffrey Howard’s grandson, Simon Howard (born 1956), now lives at Castle Howard with his wife and young twins. He and his brother Nicholas serve as directors of the private company which owns the property. Castle Howard is one of the most familiar of England’s great country houses because it is the setting of Brideshead Revisited , Britain’s most popular TV miniseries ever–until Downton Abby. The magnificence of the house, its furnishings and art, and the lavish landscaping have earned Castle Howard status as one of England’s 10 Treasure Houses. Architect Sir JohnVanbrugh, who also designed Blenheim Palace, was untrained in architecture but was a well-known Restoration playwright and fellow Kit-Cat Club member with Lord Carlise. “Vanbrugh had a genius for bold architectural composition,” according to architectural historian Geoffrey Tyack. Nowhere is Vanbrough’s splendid baroque boldness more apparent than in the soaring, 70-foot domed great hall of Castle Howard, which centers the house’s main block. The dome rests on pendentives that were painted by Antonio Pellegrini and supported by towering, squared Corinthian columns. Corinthian columns also facade the south front, with the plainer Doric columns fronting the north. The juxtaposition of columns is just one of the clashes of classical architecture seen at Castle Howard. Because construction of the house (far too modest a word to convey its grandeur) took 117 years to complete and employed several architects, baroque and Palladian architecture blend together in Castle Howard’s exterior. Visitors begin the tour in the west wing, which features guest rooms and state rooms with impeccably restored furnishings and museum-quality art by the Reynolds, Ruebens, Gainsborough, Holbein, and 17th and 18th century Italian masters. Some of the more memorable rooms on display are the 6th Countess’s bedchamber furnished with the bed given her by her parents, the 5th Duke of Devonshire and his wife Georgiana, and pictures of her 12 children; the turquoise drawing room; the museum room; the music room; the crimson dining room; the long gallery; the collonaded antique passage; and the China landing with its 18th century English and German porcelain. Nestled in the Howardian Hill, Castle Howard’s 1,000-acre grounds feature gardens and parkland that are only part of the 6,000-acre agriculture estate surrounding Castle Howard. Entry points to Castle Howard’s grounds feature tree-lined allees. During the warmer months, visitors can take free guided tours of Ray Wood, or they can also take a self-guided tour with a trail booklet. Ray Wood is a lusciously planted woodland with a variety of trees and flowering shrubs that can be explored along serpentine paths. The guided garden tour ends at Vanbrough’s Temple of the Four Winds, a grand summer house that affords sweeping views of the South Lake, Cascade, New River, the ornamental New River Bridge, and the grandest Mausoleum in the Western Hemisphere. 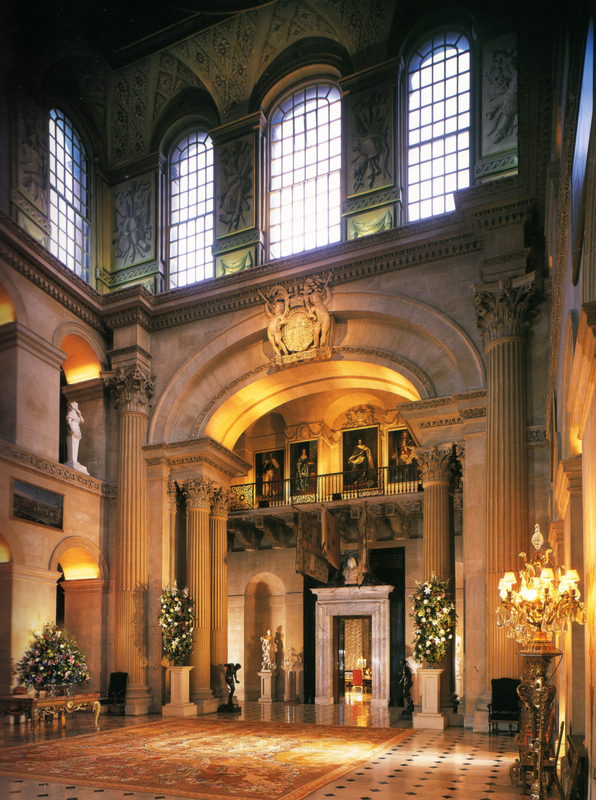 The Mausoleum, while built by committee, was originally inspired by Nicholas Hawksmoor, the Wren-trained architect who assisted Vanbrugh and took over as Castle Howard architect after Vanbrugh’s death in 1826. Built for the 3rd Earl who created Castle Howard, the 90-foot tall, domed mausoleum supported on 20 pillars was not completed until six years after the earl’s 1758 death. To this day, family members are buried in the mausoleum, which is not open to the public. Their bodies are carried along New River to their final resting place. All the waterways at Castle Howard, including the great lake, are manmade. The property’s massive walled garden features three rose gardens planted with over 2,000 varieties. The South Parterre Garden of grass terraces replaces an earlier formal garden, but the parterre’s center Atlas Fountain is original. Spending an entire day in York at Castle Howard is one of the most memorable days imaginable. In my opinion.–Cheryl Bolen’s most recent book is the latest installment in her popular House of Haverstock series. It’s a novella titled Ex-Spinster by Christmas. Look for her next release in her Brazen Brides series in May. The spinster sister of the immortal poet William Wordsworth was present at the creation of his and Samuel Taylor Coleridge’s 1799 Lyrical Ballads, which gave birth to the Romantic movement in English literature. She was also present throughout her famous brother’s adult life. Brother and sister, among the five Wordsworth siblings orphaned and separated at an early age, would rejoin when Dorothy Wordsworth was 24 and William 25, and they would live under the same roof until William’s death 55 years later. One leaf on the top of a tree—the sole remaining leaf—danced round and round like a rag blowing in the wind. The first of her journals, The Alfoxden Journal 1798, takes up less than ten percent of my volume from Oxford University Press. 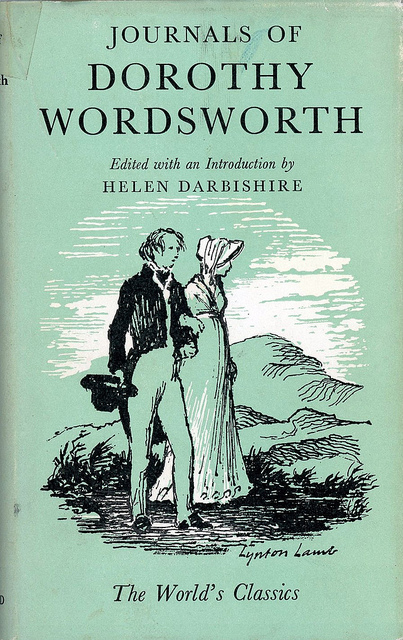 Of more importance are The Grasmere Journals 1800-1803 because they record Dorothy Wordsworth’s observations of the Lake District which her brother and Coleridge made famous. Dorothy and William moved to Dove Cottage in Grasmere the last month of the eighteenth century. Two years later William married Mary Hutchinsons who, along with her orphaned siblings, had been close to the Wordsworth orphans for many years. There is no jealousy on Dorothy’s part toward the woman with whom she would share the brother she had lived alone with for the previous seven years. Perhaps that is because as Mary busied herself with mothering the five children she bore William, Dorothy remained William’s companion on their legendary walks throughout the Lake District. These journals, which are copyrighted by the Dove Cottage Trust, give those of us reading them two centuries later a feel for the minutia of their everyday life: the ringing of distant sheep bells, haystacks in the fields, baking day. Surprisingly, to Dorothy, plodding through the frost of a cold January day was pleasant, but summer heat could send her to bed for days. For the author of English-set historicals, these journals are an invaluable source for descriptions of the English countryside—its plants, birds, and other creatures—in every season of the year. This little volume is a keeper.—By Cheryl Bolen, whose latest release is Ex-Spinster by Christmas, a House of Haverstock books. In the century and half since the last princess died, no one has ever before had the fortitude to chronicle the lives of the six daughters of George III (1738-1820) and his wife Charlotte of Mecklenburg-Strelitz (1744-1818). Until Flora Fraser. 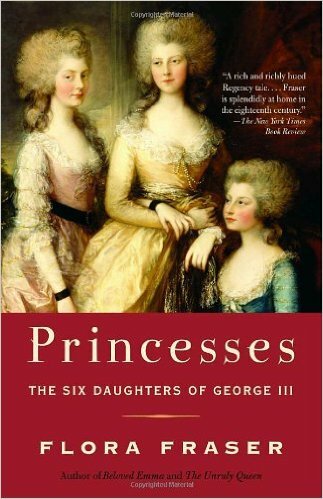 In 2006, she published Princesses: The Six Daughters of George III. One of England’s premier biographers of the late Georgian era, Fraser (Beloved Emma) first became acquainted with the princesses when doing archival research for her biography (Unruly Queen) of their sister-in-law, the Prince Regent’s wife. The circumstances which catapulted their lives onto a sorrowful trajectory, of course, were the intermittent bouts of the king’s insanity which terminated in a nine-year regency after he was declared incompetent to rule. His first occurrence of the illness was in 1788; it was another 23 years before the regency became official. Sadly, it was during those years the princesses came of age, only to be denied the opportunities for gaiety and marriage. The king’s illness turned a concerned mother into a domineering tyrant who deprived the princesses of any hopes for happiness. During those years, the princesses were forced to forgo personal pleasures or aspirations for matrimony for fear it would incite another relapse in the father who was so excessively fond of his daughters. To a one, all the princesses wished to marry, to have their own homes, to have children. Most of them would be denied these simple pleasures. When he spoke those words, “Royal,” as the eldest sister was always called, was the only sister to have married. Her father had refused many offers for her hand, a fact that embittered her. She finally succeeded in marrying a widow, the Hereditary Prince of Wuttemberg, when she was thirty. She was thrilled to escape “The Nunnery,” a title the princesses themselves dubbed their residences at Kew Palace and Windsor Castle. She never regretted the decision to marry. While she never bore a live child, she was an indulgent mother and grandmother to her step-children and may have been the happiest of the sisters. None of the sisters would ever become a mother, though the fourth princess, Sophia (1777-1848), gave birth secretly to an illegitimate child sired by her father’s equerry, who was more than thirty years older than she. She never married. Amelia died of tuberculosis at the age of twenty-seven, which many think contributed to her father’s final fall into hopeless insanity. Even on her deathbed, her family would not allow Amelia to marry the young officer she had been in love with for eight years. Her sister, Princess Augusta (1768-1840), also fell in love with a military man, Gen. Sir Brent Spencer. When she was 43 she wrote a letter to the regent that begged to be allowed to marry the man who had shared her “mutual affection” for twelve years. Request refused, she died a spinster. Princess Mary had more luck. She demanded the regent allow her to wed her cousin, the Duke of Gloucester, whose father was her father’s brother. The regent reluctantly agreed. At age forty, she finally married. While it is doubtful she was in love with her husband, she relished the first liberty she had ever tasted. The sister who had most wanted to marry and had dreamed of bearing a child, Princess Elizabeth, finally was granted one of her wishes. At age forty-eight and well past child-bearing years, she married the Landgrave of Hesse-Homburg and had a happy marriage for eleven years. Fraser’s research is meticulous, right down to the names of the royal wet nurses and the salary paid to them. Almost all of the research is original, delving into letters in collections, archives, and libraries across the globe, a feat that had to have taken several years. For the casual reader, there are a few problems. First, it is difficult to chronicle six lives at once chronologically. We get a snippet of one sister, but the narrative thread drops while there is an awkward transition to another sister because of chronological constraints. Therefore, the book makes for dry reading and lacks dramatic structure. For the historian, this work is a gem. 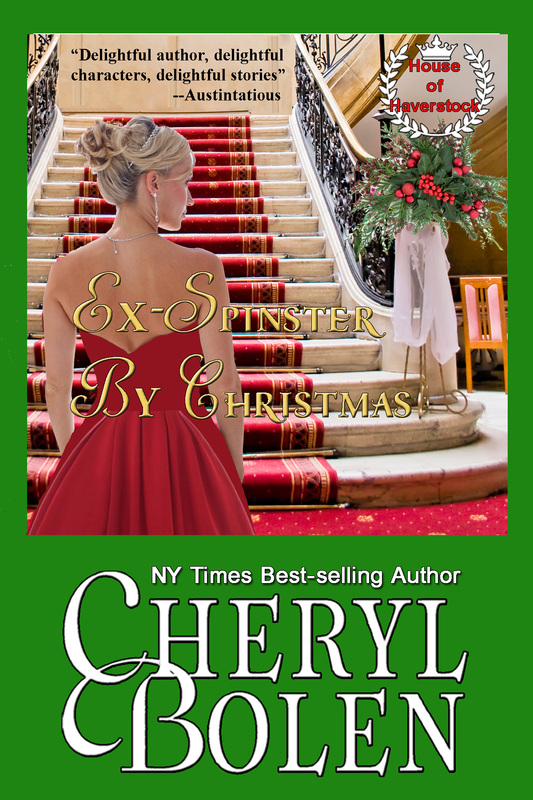 Cheryl’s newest release is Ex-Spinster by Christmas (House of Haverstock #4). The Duke of Wellington and Napoleon opposed each other not only on the battlefield but also for the affections of a certain beautiful lady. That lady, Madame Recamier, spurned both of these powerful men. Napoleon was so outraged, he banished her from France and her famed Parisian salon where authors and intellectuals—most of whom despised Napoleon—gathered. 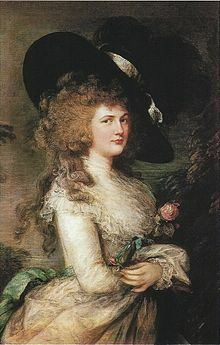 In an era when, as Lord Egremont said, “Women considered it a stain upon their reputation if they hadn’t taken a lover,” Juliette Recamier (1777-1849) went four decades without knowing a lover—not even the wealthy, much-older banker she had married at age 15. Called a frigid coquette, Madame Recamier directed her sensuous flirtations on virtually every man who came to her salon on rue du Mont-Blanc—and most of them became captivated by her beauty and voluptuous charm. Author and political philosopher Benjamin Constant said, “Madame Recamier takes it into her head to make me fall in love with her . . . My life is completely upset.” For the next fourteen months, he was tortured by his unrequited love for her. He was one of dozens over the years. Lady Bessborough, who was among the English aristocrats who flocked to Paris in 1802 after the signing of the short-lived Treaty of Amiens, gives this interesting account of meeting the beautiful Madame Recamier. I must tell you [Lady Bessborough wrote to her lover, Granville Leveson Gower] tho’, a nasty and an indelicate story, but how distress’d I was at Mad. Recamier’s. We went there and found her in bed—that beautiful bed you saw prints of—muslin and gold curtains, great looking glasses at the side, incense pots, &c., and muslin sheets trimm’d with lace, and beautiful white shoulders expos’d perfectly uncovered to view—in short, completely undress’d and in bed. The room was full of men. During her salons, Madame Recamier commonly reposed on a chaise longue—a piece of furniture which would later be named a recamier in her honor. 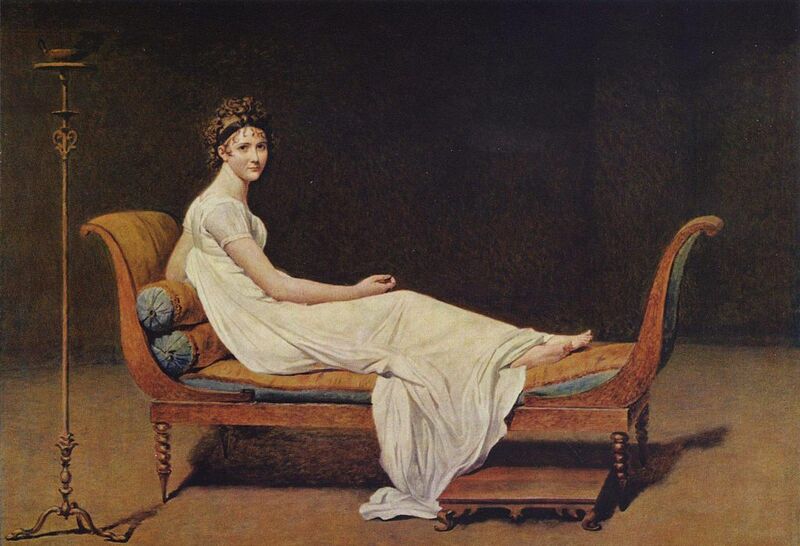 A famed portrait by Jacques Louis David of her on her chaise longue hangs in the Louvre. The only child of Marie Julie Matton and Jean Bernard, the king’s counsellor, Juliette was born in Lyon, but the family later moved to Paris. During the Reign of Terror, she married Jacques-Rose Récamier, who was 27 years her senior. Mystery surrounds the marriage. There is some credence that Recamier married to pass on his fortune if he should fall to the Terror. It was said he was very close to Juliette’s mother. Some suggested Juliette remained a virgin because Recamier was her natural father, but this has been discounted. As she neared the age of thirty, Madame Recamier finally fell victim to Cupid’s arrow when she fell in love with Prince Augustus of Prussia, a nephew of Frederick the Great. They met in the Swiss home of her friend, the famed Madame de Stael, who encouraged the romance. Juliette Recamier wrote to her husband to ask for a divorce, but at the time he was besieged with financial woes (he eventually went bankrupt). His response appealed to her sensibilities while telling her she could not have picked a worse time. He also expressed regret that he had respected her virginal susceptibilities. The Recamiers did not divorce, and Prince Augustus never married, though two of his long-time mistresses bore him eleven children. 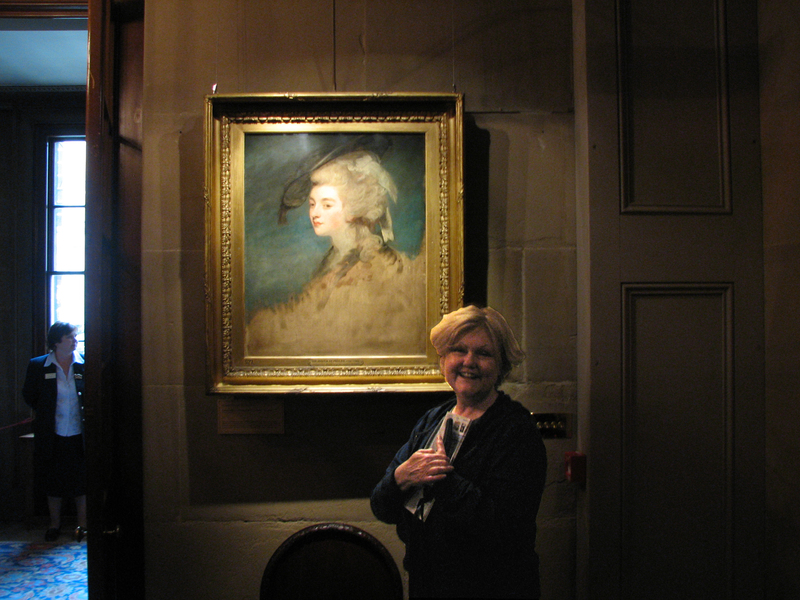 Ten years after he fell in love with Juliette Recamier, he had his portrait made standing in front of her portrait. Back in Paris, the Recamiers were forceed to sell their house on the rue du Mont Blanc, their silver, and Juliette’s jewelry. She suffered the losses with the same languid serenity that governed her life. By 1809, Recamier was once again in business but on a much smaller scale. Even though her circumstances were reduced, Madame Recamier’s salons were as popular as ever. Later she resided in apartments in a former convent, now demolished, at 16 rue de Sèvres in Paris. It is believe she finally lost her virginity at age 40. Her lover was the 50-year-old author Chateaubriand. Her husband died in 1830. She lived another nineteen years before cholera claimed her at age 71. She was buried in the Cimetiere de Montmarte. Herold, J. Christopher. Mistress to an Age: A Life of Madame de Staël. The Bobbs-Merrill Company, Inc., 1958.